HomeCorners - Don't buy Casper Mattress Before You Read This. After all the hypes about the newly release mattress said to be one of the best on the world, I decided to devote some time to do a small research about the Casper mattress. Being newly release on the middle of 2015, I would say that Casper the fastest grown mattress start-up this year or in the history. Only in a few months they have made a product that can compete with the bigger competitor like American and Tempur pedic. What is Casper Mattress actually? Casper is basically a combination of a two world most famous mattress material available: the memory foam and latex. Casper combines them by putting premium latex as the top layer and a high-density memory foam as the support or the bottom layer. It means that you will get the great contour provided by the memory foam while retaining the bounce and cool temperature provided by the latex. 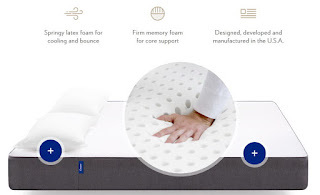 We all have read that memory foam, created by NASA engineer was designed for a better long hours sleeping by memorizing our body contour, however it did lack the bounce effect we use to get from a regular mattress and sometime it will sink us to deeply. Another drawback of a memory foam is that some user reported a warmer temperature due to its density. This might be good in a cold winter however on a hot summer this is a problem especially if you like to take a nap during the weekend days like I do. The latex on the contrary has a great bouncing effect love by the kids and some elders. Some romantic activities on the bed with our partner actually need a bouncing help from the mattress. We don't want to be sink every time we push our way down, don't we? That would be too tiring and boring. Latex is known good for the bouncing and it is cooler as well. However we don't do activities all night long and on all nights, most of the time we will just sleep on it. This is where memory foam is good at. For years, customer like us always curious would there be a company who will come up with a simple strategy to combine the benefit of memory foam and latex into a single bed. A better product yet without sacrificing the quality yet retaining the price. We certainly do not want to have two different beds just to sleep, right? It seems the idea was captured by three young men who founded the start-up: Jeff Chapin (Head of product), Neil Parikh (Materials design) and Gen Suzuki (Industrial design). The three of them decided to take seriously the idea to combine them, produce and tested them to various people. Listening to the feedback, they work days and nights to improve the combination and to find a single solution for all type of sleeping habits. Some users even reported that their dogs even love to sleep on it. Where does the Casper Mattress Made? For those who are always curious about the quality especially related to whether this product is made in China, you'll amaze that with their price which is nearly half of the competitor, the Casper mattress is made in the USA. The internal structure is made in Pennsylvania and Georgia while the covers are hand sewn in South Carolina and Illinois. That sounds good for me, however I still wonder of where the material come from. Called me a nerd but I spent one third of my life on a mattress so I deserve to know. Surprisingly the components are also come form USA: Illinois, South Carolina, North Carolina, Georgia and New York City. Only one textile component come from outside USA: the woven which come all the way down from Belgium. I'm sure they are all good quality. Not only the mattress is wonderful, the covers is also fantastic. It is breathable, flexible and resilient. Best of all it is easy to remove and washable. No wonder as the Casper cover is made from a premium fabric quality from USA and Belgium. I love to regularly wash my mattress cover, yup not only the bed sheet. It's a good and healthy practice and I recommend you to do the same. I really love cleanliness and security. Read my other review: best touchscreen door lock. Looking at their site and shop, I noticed that they only have one product to sale: the Casper mattress and no other mattress types. Some will way this is bad as no other option. However for me, this actually shows that the Casper team are trying their best to make one mattress that will fit to anybody. No matter who you are, how much you weight, how is your sleeping position; one solution for all everybody needs. This has actually reminds me of the beautiful movie about Stephen Hawking: The theory of everything. Could this be "The mattress of everyone?" What size available for Casper Mattress? Twin, sizing: 39" x 75"
Twin XL, sizing : 39" x 80 "
Full, sizing : 54" x 75"
Queen, sizing : 60" x 80"
King, sizing : 76" c 80"
California King, sizing : 72" x 84"
What base will be able to support the Casper Mattress? FLAT PLATFORM : The floor or a flat platform will offer direct support under your Casper. BOX SPRINGS & FOUNDATIONS : The Casper mattress works with most box springs. Just make sure there is no more than three inches between each supporting wooden slat. What is the drawback of the Casper mattress ? Some user reported the off-gasing that is the smell of the foam in the first few days after opening from the box. This is normal for any mattress on the market and ti will go after a few days. I think this is not a major problem. Thrust me, it happens, right? A bed that loves you back. The Casper experience was designed with you in mind. One bed — optimized for sleep and backed by a 100-night, no-hassle return policy and our 10-year warranty. Casper mentioned that due to their innovative business model, they are able to profitably sell the Casper for three times less than what it would cost in a store. This mean this is not another "cheap" product although the price is half the competitor. With free shipping & return, 100 night free-trial and 4.5 star genuine customer review in Amazon, is it worth just to check the price? Sneak the price here, or read further review (opens in a new window). Learn More Before You Buy Casper Mattress.